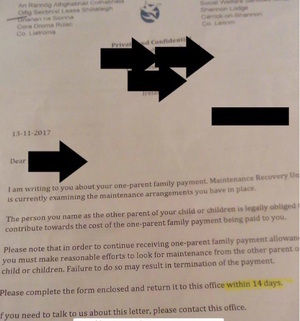 When a pregnant abused mother goes to court and gets a safety order and explains to @welfare_ie why she can’t get maintenance, is it appropriate they then write threatening letters like this? Should vulnerable files not be flagged and protocols put in place? Posted in Misc and tagged letter, Maintenance, pregnant mother, safety order, Welfare at 12:46 pm on November 21, 2017 by Bodger. 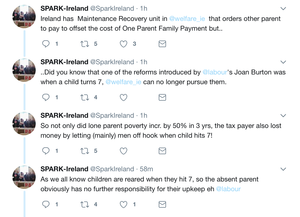 So @joanburton who exactly did your reforms help? 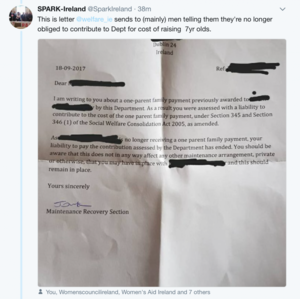 Not the taxpayer, not children or their parents but the parents who don’t want to pay! Posted in Misc and tagged lone parent payment cut, SPARK, Welfare at 1:23 pm on September 25, 2017 by Broadsheet. Posted in Misc and tagged Thomas Street, Welfare at 3:10 pm on November 30, 2015 by Broadsheet. The Health Information and Quality Authority (HIQA) examined the child protection and welfare services provided to children and families in direct provision centres in four areas across Ireland. The four areas – the Midlands, Sligo/Leitrim/West Cavan, Louth/Meath and Dublin North city – had approximately 650 children living in seven centres. 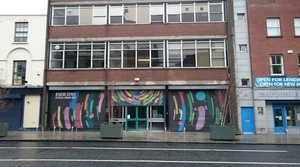 In relation to the Reception and Integration Agency – which is responsible for accommodating asylum seekers and coordinating services for asylum seekers – the inspectors met with the manager of the Child and Family Services Unit of the RIA to find out how the unit interacts with the Child and Family Agency in relation to child protection and welfare referrals. HIQA also sent six questionnaires to the RIA and to managers of the direct provision centres involved. Just three completed questionnaires were returned. 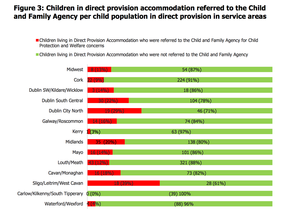 Data from the Child and Family Agency showed that there were 209 referrals of child protection and welfare concerns about 229 children living in direct provision accommodation in the 12 months between August 2013 and 2014. 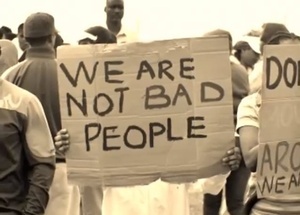 This represented approximately 14% of the population of children living in direct provision. This is a significantly higher referral rate than for the general child population of 1.6%. Of the 209 referrals, 178 (85%) reached the relevant threshold criteria for an initial assessment. This is considerably higher than the average threshold of 50% of all referrals in 2013 that required initial assessment and, as with the higher referral rate for children in direct provision, requires further analysis by key stakeholders to determine reasons for the disparity. 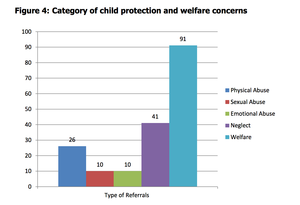 Following initial assessments, the breakdown of the primary report type was 91 (51%) referrals relating to welfare concerns and 87 (49%) relating to child protection concerns which reflects the national breakdown of all referrals to the Child and Family Agency in 2013. During fieldwork in four areas, inspectors found common themes arising from welfare concerns including physical or mental illness of parents impacting on their capacity to care for their children, children’s mental health issues, and gaps in the provision of practical support. The child protection concerns included exposure of children to domestic violence, physical abuse due to excessive physical chastisement, protection concerns about older children left caring for younger children, and children being left alone unsupervised. For a small number of children, action was not taken to protect them. Cases were closed prematurely and in one area, Louth/Meath, there were significant delays in completing assessments and sharing information, which placed children at risk and some children were not interviewed as part of the assessment process. In this area children did not receive the services they needed, initial assessments were not completed and some risks were not addressed. Inspectors found that on occasion the Reception and Integration Agency moved families for safety reasons but gaps in communication between the providers and the Child and Family Agency at local level meant that this information was not always passed on and, as a result, some social work interventions were delayed or did not happen and potentially placed children at risk. Of the 87 child protection referrals nationally in 2013 about children in direct provision accommodation, the Child and Family Agency sought and obtained care orders for 13 children, made 18 notifications to An Garda Síochána about abuse, identified 11 children as being at risk of ongoing harm and five children were placed on the child protection and notification system. In Louth/Meath, there were significant delays in social work interventions. Of particular concern was that in 27 out of the 38 cases reviewed, children were not met with or seen by social workers to inform their decision making about the referral even though records indicated concerns about their safety and welfare. For example, in one case there were significant concerns about an allegation of physical abuse of two children and the case was closed without children being visited. One referral about a child threatening suicide was waiting three years for a response from the team in Laois/Offaly. Posted in Misc and tagged children, Direct Provision, HIQA, Welfare at 1:42 pm on May 25, 2015 by Broadsheet. “The High Court has ruled emergency laws underpinning a government back-to-work scheme are “incompatible” with the European Convention on Human Rights. 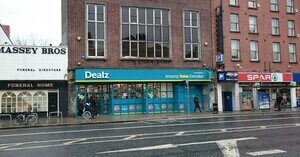 The ruling stems from a case brought by Cait Reilly in 2012, who said being forced to work for free at a Poundland store breached her human rights. The 24-year old graduate challenged the legality of an unpaid work placement she undertook in 2011, part of the government’s “mandatory work activity” programme. Over to you Ms Burton. Posted in Misc and tagged JobBridge, Welfare at 3:19 pm on July 4, 2014 by Broadsheet. 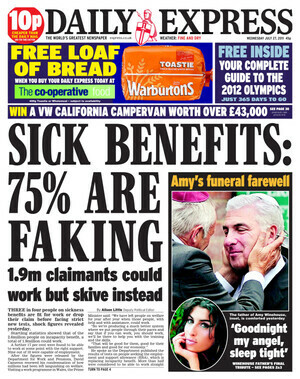 Posted in Misc and tagged Daily Express, Welfare at 9:23 am on July 27, 2011 by Broadsheet.